Until now, there has been only one source of data on global fishery catches: information reported to the Food and Agriculture Organization of the United Nations by member countries. An extensive, ten-year study conducted by The Sea Around Us Project of the University of British Columbia shows that this catch data is fundamentally misleading. Many countries underreport the amount of fish caught (some by as much as 500%), while others such as China significantly overreport their catches. The Global Atlas of Marine Fisheries is the first and only book to provide accurate, country-by-country fishery data. This groundbreaking information has been gathered from independent sources by the world’s foremost fisheries experts, and edited by Daniel Pauly and Dirk Zeller of the Sea Around Us Project. The Atlas includes one-page reports on 273 countries and their territories, plus fourteen topical global chapters. National reports describe the state of the country's fishery, by sector; the policies, politics, and social factors affecting it; and potential solutions. The global chapters address cross-cutting issues, from the economics of fisheries to the impacts of mariculture. Extensive maps and graphics offer attractive and accessible visual representations. While it has long been clear that the world’s oceans are in trouble, the lack of reliable data on fishery catches has obscured the scale, and nuances, of the crisis. The atlas shows that, globally, catches have declined rapidly since the 1980s, signaling an even more critical situation than previously understood. The Global Atlas of Marine Fisheries provides a comprehensive picture of our current predicament and steps that can be taken to ease it. For researchers, students, fishery managers, professionals in the fishing industry, and all others concerned with the status of the world’s fisheries, the Atlas will be an indispensable resource. "A science-steeped volume that tells the story of finding the clearer window into fisheries we have today through the research itself...this data empowers fellow biologists, NGOs and policymakers to begin chipping away at the problems that face fisheries worldwide." "Accurate data on catches is critical...thanks to [The Global Atlas of Marine Fisheries]...we have a much better knowledge of how much fish is being caught from the ocean." 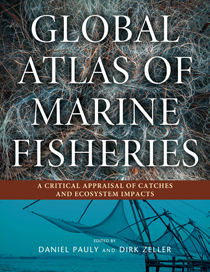 "Excellent fundamental background reading: from the sobering position of worldwide fish stocks, the economic and technical conditions, regulatory options up to individual country profiles, the reader is furnished with a rich treasure of information...For all those closely interested in or associated with the sea, this atlas is strongly recommended." "Highly informative and intellectually compelling...Pauly and Zeller's Atlas will provide considerable grist for thoughtful discussion, reflection, and argument." "Uses new methods to present a truer picture of world fish stocks and their exploitation, and explains what these methods are." "This book is the first to provide detailed fishery catch data covering literally the entire world's oceans...The atlas will be an indispensable resource and should inspire the management of marine fisheries in ways that will restore their productivity as opposed to accentuating their decline. "The word monumental is overused but rarely has a book more deserved it. An extraordinary account of the state of the world's fisheries. Essential reading." "This packed volume offers an all-you-can-eat buffet of information on global fisheries catches: comprehensive and provocative." "This timely publication makes a very significant contribution to our understanding of what is actually happening with the world's fisheries and effectively makes the case that improved management requires more holistic approaches and less institutional and disciplinary fragmentation." Chapter 12. A Global Analysis of Mariculture Production and Its Sustainability, 1950-2030 \ B. Campbell, J. Alder, P. Trujillo, and D. Pauly). Please click this link to download the corrected version of figure 2 from page 369. While it has long been clear that the world’s oceans are in trouble, the lack of reliable data on fishery catches has obscured the scale, and nuances, of the crisis. Based on an unprecedented 10-year research study by the world's foremost fisheries experts, the Global Atlas of Marine Fisheries will fundamentally change the way the world thinks about ocean exploitation and management. It is the first and only book to provide accurate, country-by-country fishery data. Edited by Daniel Pauly and Dirk Zeller, the book includes one-page reports on 273 countries and their territories, plus fourteen topical global chapters. It will be an indispensable resource for researchers, students, fishery managers, professionals in the fishing industry, and all others concerned with the status of the world’s fisheries. Check out an excerpt from the book below.